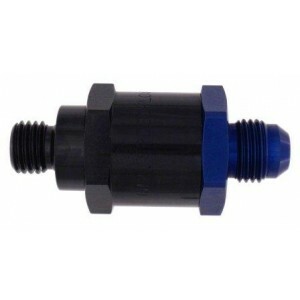 Billet aluminum in-line check valve for Bosch FP044 pump. Threads directly onto pump outlet and -8 male AN fitting on outlet side. 2-3 PSI cracking pressure. Good for use in gasoline or methanol applications. This billet aluminum check valve is specifically designed for the Bosch FP044 pump and will thread directly onto to the pump outlet. It comes with a viton o-ring installed and an optional methanol compliant o-ring if your running methanol fuel. These high quality check valves are manufactured for Fuel Safe by Speedflow Technologies in Australia.